The full article on Dr. Ho’s is here. Short report below. Best American style pizza in the Charlottesville area? Best cheese bread? Best wings? Best french fries? Best nachos? Best fried fish? Best strombolis? 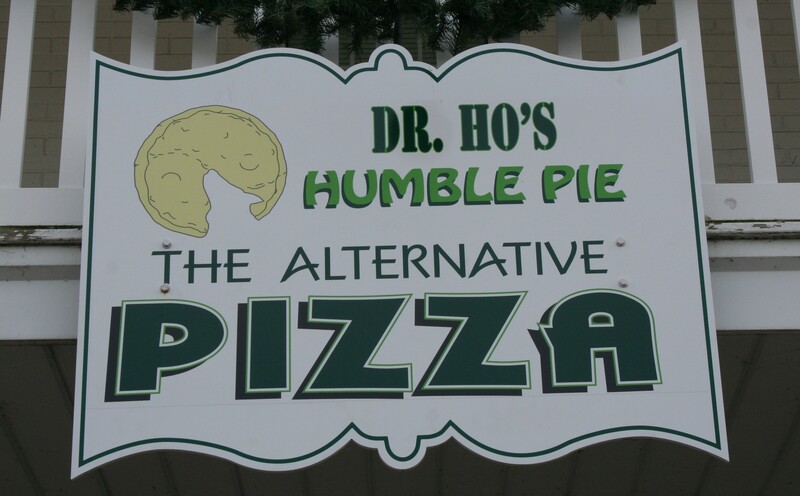 A good case can be made that all of these can be found at Dr. Ho’s Humble Pie, the pizza joint nine miles south of town founded by Gerry Danner and now run by chef-owner Michael McCarthy. McCarthy’s passion for simple, honest food and his refusal to take short cuts mean that nearly everything on the menu is outstanding. There are few restaurants whose food we crave as often as Dr. Ho’s. McCarthy’s narrow focus on honest food means that if you close your eyes and point, you’ll probably be happy. The ever-rotating specials, however, are often standouts. Among the pizzas, deserving special mention is the Bellissima, which is a riff on the prosciutto-and-arugula combination popular in parts of Italy. Instead of prosciutto, which can be expensive, McCarthy uses thin slices of Turner Country Ham. Atop that, McCarthy places a salad of arugula tossed in a lemony vinaigrette, and shavings of parmigiano-reggiano. McCarthy considers it his favorite pizza on the menu. Ours too. And, we are not alone, as the pizza seems to have developed a cult following around town. The Fat and Sassy, mozzarella, cheddar & roasted garlic loaded on to Dr. Ho’s heady crust! Served with the best ranch dressing you’ll ever have and marinara sauce. Stromboli, Just what the doctor ordered. Choose three toppings from the list and we will make you a mind blowing stromboli sure to cure what ail’s you. Served with mozzarella cheese, ho-made marinara sauce and ranch dressing. Pizza, any kind you like!